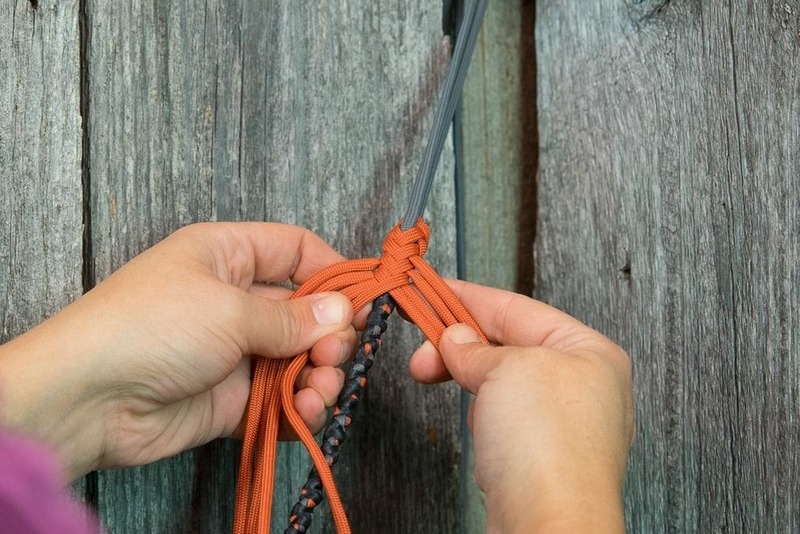 The basic parts of a whip are the handle, transition, thong(the plaited/braided portion), fall(usually easily changed), and cracker(easily changed). The thong is the part we will look at below. How a whip is made will dictate how it performs. My belief is the quality of each layer contributes equally to the quality of the final piece. If each layer is made tight, straight, and lined up correctly with the layer below, it will be as accurate as I can make it. In most of the whips I make, there are three to four layers, starting with the Twisted Taper core. One thing that I always do is end each plaited layer in a twist that tapers and use the ends of that layer to twist into the next- all but the overlay, or outside. What I believe this does is keeps everything tight, straight, and connected. There are no soft spots from the end of the core to the next belly- everything is as solid as I can make it. The core is twisted from strands of gutted paracord, dropping strands to introduce a subtle but steady taper, then bound with artificial sinew. 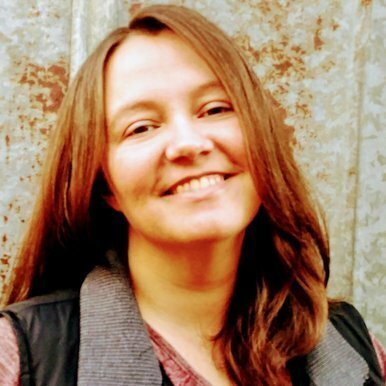 This layer usually starts with four strands and drops gradually down to two. What makes my cores unique is they are twisted extremely tight- more like a steel cable in feel than a rope. The first belly is plaited on the core tightly in herringbone plait, ending in a Twisted Taper that twists with the end of the core. The plait count depends upon the size of core. Most commonly, this layer will be eight plait. 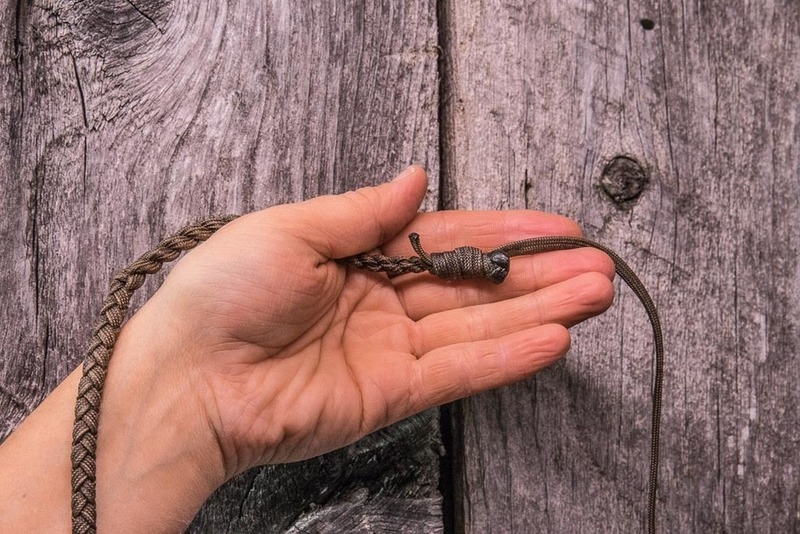 The second belly is also plaited in herringbone plait, a twelve plait that eventually ends in a Twisted Taper that is twisted together with the end of the first belly. 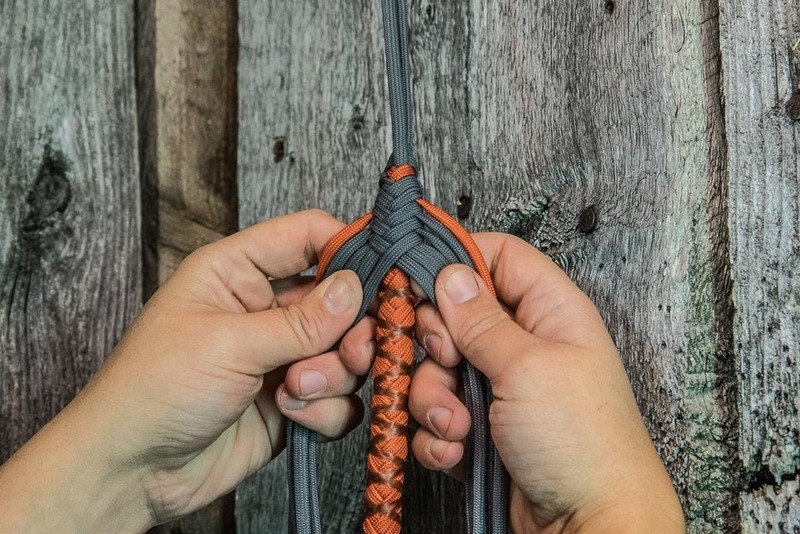 This layer is plaited tight and ends in a Twisted Taper, but strands are tucked inside one another before knotting like a traditional Florida style Cow Whip. Now for the fun part! Here is where you, as the new owner, get to be as creative as you like! More than one color, different patterns, or solid color with or without patterns, as you prefer. This layer is usually sixteen plait. 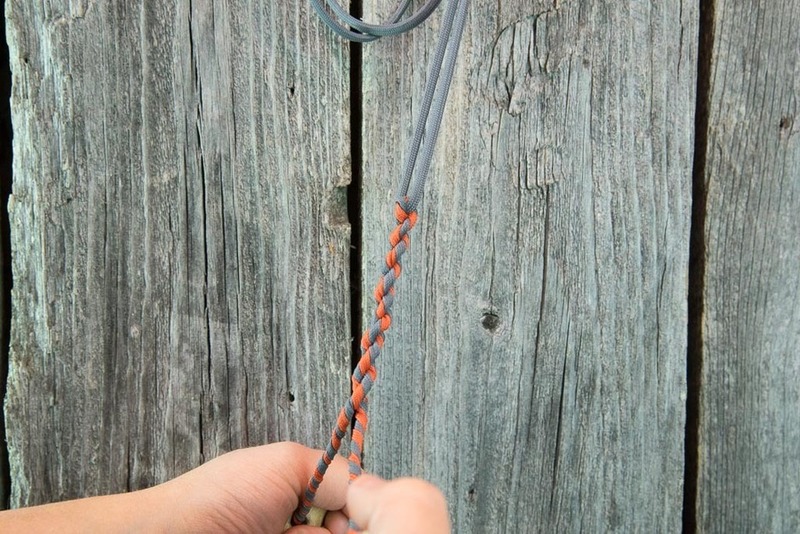 The fall is usually a gutted strand of paracord that attaches to the end of the thong with a variation of a Snelling Knot. This simple piece of cord takes a lot of wear which greatly increases the life of your whip. It is quick and fairly easy to replace. This piece really is a workhorse of your whip- it produces that pow that makes using the whip so much fun! Most of the whips I make come with a long lasting Dyneema style cracker, which is best for the working cow whips due to the long life. You can purchase high quality replacement Dyneema style crackers from Whip Nation. Credit is due to Jeramie Jones for the great photos above. Thank you, Jeramie!